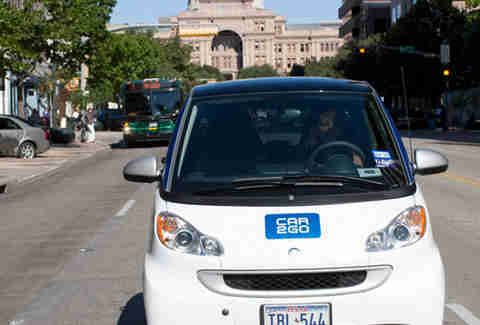 After launching a city-employee pilot program in November, Daimler's C2G unveils its fleet of 200 SmartCars to the general public this Friday, allowing vehicle-challenged Austinites the opportunity to experience the joys of traffic snarls, road rage, and NPR rage. Here's how it works: sign up online for an absolutely free membership, then use the Internet, iPhone app, or telephone hotline to find the nearest Smartcar (conveniently parked on streets throughout the city), and unlock the car using your membership card; then after you're done buying underwear at WalMart, simply leave the car at any public curbside parking space, and go home to enjoy that new-undies smell. Charges are metered by the minute ($.35), hour ($12.99), or day ($65.99 up to 150 miles, after which it's $.45/mi); the flat-rate includes insurance, free parking at city meters, maintenance, mileage, and even gas, which you can refill gratis using your C2G card at any of 500 service stations affiliated with Wright Express, not to be confused with the Anthony Wright Express, which made stops in Dallas, Baltimore, Cincinnati, and New York, then ran out of gas completely. C2G is celebrating their launch by taking over Republic Square Park this Friday, with live music (The Lemurs, The Black and White Years, more), food vendors, and test drives of their cars -- if you're Smart, yours'll involve high-tailing it to the nearest Southwestern Eggroll.